Athens and its lenders still have a chance to negotiate a deal that could prevent a Greek default. For a disorderly default and an exit from the eurozone to occur, Greece would have to fail on several fronts: First, it would have to fail both to reach an agreement with its lenders and to repay its debt to the International Monetary Fund by the June 30 deadline. Then, it would also have to fail to reach a deal with creditors in early July and default on its debt payments to the European Central Bank due in the coming months. At that point, Greek banks would stop receiving liquidity from the European Central Bank, savers would panic, and Athens would be forced to start printing some kind of currency. Greece would then either be suspended from membership in the eurozone or expelled completely. But regardless of the specific legal mechanism and language used in the process, the result would be the same: a Greek exit from the currency union before the end of the year. This would be the most traumatic outcome for the European Union. Upon Greece’s exit from the eurozone, depositors might withdraw their savings from other potentially vulnerable eurozone members such as Portugal, Spain and Italy to avoid taking a hit should these countries also default on their payments. Investors might divert their money into the sovereign bonds of more solvent states such as Germany, the Netherlands and Austria, making it more difficult for countries in Europe’s periphery to find financing. For the past three years, the European Central Bank’s promise to protect the eurozone calmed financial markets. However, a disorderly Grexit could resurrect anxieties about the volatile financial situation in much of Mediterranean Europe. Meanwhile, Greece’s exit would also stoke fears about the European Union’s potential dissolution, though perhaps not immediately. In the short run, a Grexit could actually lead to stronger support for the eurozone across Europe, as social unrest, high inflation, capital controls, and political fragility would beset Greece following a default. Voters in countries like Spain and Italy may deem a similar departure too risky. In the first months after Greece’s exit from the currency union, Eurosceptic parties such as Spain’s Podemos and Italy’s Northern League would likely lose some support. But in the longer term, a Grexit would raise serious questions about solidarity in the European Union, specifically whether the bloc’s largest economies are really willing to protect their weaker members. Regardless of the outcome of the Greek crisis, financially vulnerable countries will see Germany as the villain. The initial panic surrounding Greece’s departure would eventually die down, and more importantly, at some point the Greek economy would start growing again — proving that there is life after the eurozone. At that point, Eurosceptic parties would probably reemerge, possibly even stronger than before. Greece’s debt crisis is not likely to come to such a dramatic conclusion. And if Athens and its creditors reach a temporary agreement, a more nuanced economic and political dynamic could play out across Europe. After falling significantly since the crisis days of late 2011, when the collapse of the eurozone seemed imminent, bond yields started rising again between late February and early March of this year, as Athens and its lenders continued negotiations. The recent behavior of bond markets is a reminder that the lengthy negotiations and the constant threat of a Greek default and exit from the union could prove just as dangerous as an actual Grexit. During the second half of the year, Spain will be a key country to watch. The Spanish economy is growing again, and — even though many new job opportunities are precarious at best — the country’s unemployment rate is slowly decreasing. 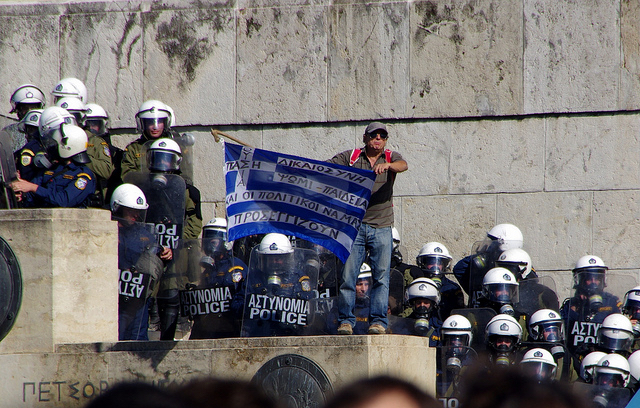 However, the political consequences of the crisis are only now becoming clear. Most notable, the country’s traditional two-party political system is broken. Spain’s regional and municipal elections in May showed that four parties are now in close competition for votes. After the May elections, Spain’s center-left and left-wing forces managed to form alliances in several regions and municipalities. To varying degrees, many of the new local and regional governments question the measures of fiscal consolidation that have been introduced in Spain during the past four years. Some new leaders who campaigned on the promise of debt renegotiation will be closely watching the progress of the Greek negotiations. Spain’s finance minister recently announced plans to meet with several mayors and regional presidents in the coming weeks. The conservative central government’s main fear is that the new administrations will try to reverse the austerity measures that it introduced with support from the European Union. But Spain’s ruling Popular Party may not even be in power in six months. The country will hold general elections before the end of the year, and Spain will face one of two potential scenarios: It may have a conservative government that will become locked in permanent fight to keep rebellious regions and municipalities under control, or it could have a progressive government that pushes for a break with previous policies. In either case, savers and investors may fear that Spain has become too unpredictable and decide to take their money elsewhere. Another country to watch is Italy. Unlike Spain, Italy does not have to hold general elections until 2018. However, it is already experiencing a similar political breakdown, and the Italian government is likewise feeling the political impact of years of economic crisis. The ruling Democratic Party performed worse than expected in recent regional and municipal elections, weakening Prime Minister Matteo Renzi and reigniting internal frictions in the party. Renzi’s opposition is also divided, with the anti-establishment Five Star Movement and several right-wing forces struggling to form a coherent front. However, dropping voter turnout and falling support for the Democratic Party show that the Italians are still upset with the current political leadership. Like Madrid, Rome has benefitted from the recent calm in financial markets, but Italy has the second highest debt-to-GDP ratio in the eurozone, and several Italian banks performed poorly in last years’ stress tests by the European Central Bank. Discord within the Democratic Party could complicate the introduction of reforms to Italy’s financial system. A lingering Greek crisis combined with political paralysis in Rome could hurt confidence in Italy. And while the rebels within the Democratic Party are unlikely to make Renzi’s government fall, in the case of early elections, Italy could see a runoff between the center-left and the Eurosceptic right. Somewhere in between Spain and Italy is France, where popular support for President François Hollande remains very low. France is not under particularly heavy pressure from financial markets, but its political situation poses the greatest threat to the European Union. The nationalist National Front party is still very popular and will probably make it to the second round of presidential elections in 2017. The Greek crisis vindicates the party’s anti-EU rhetoric, while the United Kingdom’s push for a referendum on its membership in the European Union has inspired the French party to promise the same. The European Union could arguably survive a Greek exit, but it would not survive France leaving the bloc. In recent months, member states and EU officials have focused on the dangers of a Greek default. But even if Athens and its creditors reach a deal in the coming days, it would only set the stage for additional negotiations later in the year, prolonging the impact of a real or potential Greek exit on Greece’s partners in the currency union.